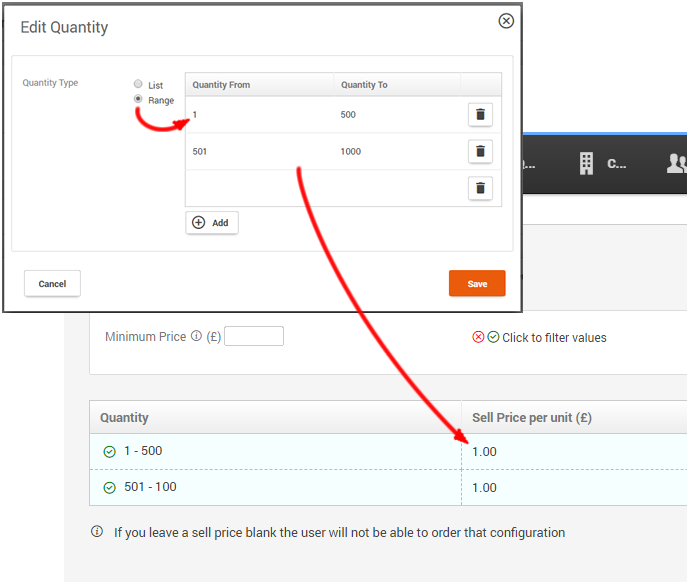 You can offer a product at certain quantities (QTYs) or let users type in the number they want. Both allow QTY Price breaks, but both work slightly differently when it comes to calculating the price. Acme Widgets might come in boxes/batches of 12. You would then offer 12, 24, 36 etc (List Price). For each QTY you would simply type in the price. So for 12 Acme Widgets it might be $56. If these Acme Widgets are sold individually you can let the user type a QTY between 1 and say 500 (Range Price). In this case you put into the system a UNIT PRICE. ie: each Acme Widget is $1.50. You only need to put the unit price in.